Kayser Fleischer is the deposition of copper around the iris of eye forming a circle. It appear as a dark colored rounded boundary of the iris. The copper basically accumulate and deposited in a specific area of cornea named descemet membrane. This copper deposition may occur as a result of a specific liver disease. This disease named after two German scientists Dr. Bernhard kayser and Dr. Bruno Fleischer. The scientist proved the idea of this disease i.e. this ring do not form due to the accumulation of iron, but it forms due to the deposition of copper. The Kayser Fleischer ring may do not show any symptoms and is detected during the examination of other diseases like liver diseases. S,o it would not be wrong to consider it a symptom of other diseases like liver diseases. The slit lamp is used to detect the presence of Kayser Fleischer ring around iris of eye before it becomes visible to the naked eye. The ring Fleischer ring 1st appear as a crescent at the top of the cornea and with the passage of time, the crescent spreads and form another bottom layer on the cornea. As already discussed earlier, the Kayser Fleischer ring do not show symptoms most of the time and is detected during the examination of other diseases i.e. liver diseases. The Kayser Fleischer ring itself is a symptom occurring as a result of other diseases. It is a common symptom of a liver disease named Wilson’s disease. 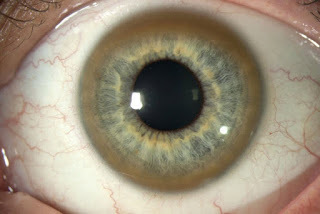 About 95 % of patients with Wilson’s disease have Kayser Fleischer ring in eyes. The boundary of the iris become colored mostly of brownish yellow color and golden. The Kayser Fleischer ring either may affect or do not affect the vision of the patient. The main cause behind the formation of Kayser Fleischer ring around the iris is the deposition of copper around the cornea of eye. The reason behind the deposition of copper on the top of cornea is due to the inappropriate functioning of liver. It is a main symptom of a liver disease named Wilson’s disease. In Wilson’s disease, the liver is not able to handle copper and lead to the accumulation of copper deposits in different parts of body including eyes. There are also other causes like cholestasis in which the bile duct is obstructed, primary biliary cirrhosis and cryptogenic cirrhosis. As the Kayser Fleischer ring itself a symptom of many diseases, so to treat the Kayser Fleischer ring its underlying cause should be treated. It is a most common symptom of Wilson’s disease. The treatment include a low copper dietary intake. The drug of choice in the treatment is D-penicillamine. Hepatic transplant is another option when the liver is no more functional in a Kayser condition. Along with medications, the routine medical checkup is required to check the presence of excess copper in blood. The medications allow the excretion of serum copper through urine.